Including popular posts in the sidebar or at the bottom of blog posts has become popular among savvy bloggers. “Popular Posts” plugins for WordPress are a smart way to attract visitors and transform them from occasional visitors to true fans. Popular posts can be easily incorporated into your website with choice of right plugin. We have researched and listed top 7 Popular Posts plugins for your WordPress powered blog or website. WordPress Popular Posts plugin allows your visitors to show the most popular entries on the blog. It is a highly customizable widget that displays the most popular posts on your blog. It lists those posts that have been popular within a specific time range. It allows you to control how most popular posts are shown on your theme. One of the most useful popular posts plugins, Top 10 allows you to easily track daily and total visits on your blog posts. It beautifully displays the count along with popular posts. You can choose how many posts are to be displayed and a host of other customization options. 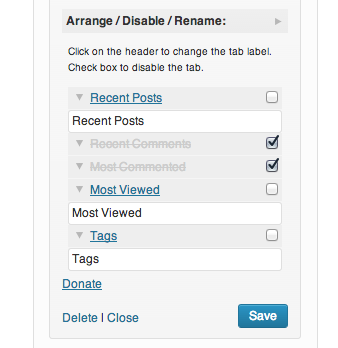 There are highly customizable widgets allowing you to control what you want to display in the list of posts. It offers you the best way to display the most popular content from your website. this plugin is easy to install and once activates, the servers immediately begin monitoring your website and start displaying the most popular content on the blog. Placing the nrelate_popular function in the theme files. Popular Widget is used to display the most viewed or most commented posts in a tabbed widget. You can filter the posts by date range or category. It is simple to use and comes with amazing features. It adds an advanced posts display widget to your site. It offers you the flexibility to display posts in the sidebars in the way you like. It is a highly customizable plugin and allows advanced users to display the resulting posts in any way imaginable. This free plugin for WordPress has been developed by Whiletrue. 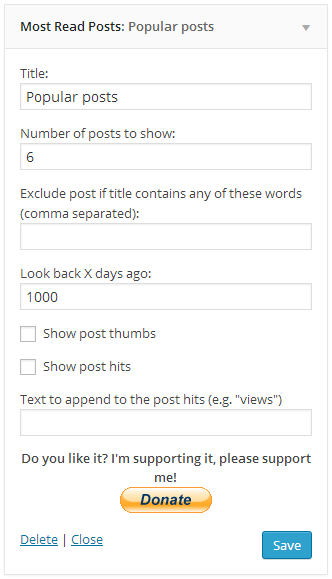 It comes with several customization options such as number of posts to show, exclude posts whose titles contains certain words, exclude posts older than n number of days etc. This simple yet useful plugin tracks your most popular blog posts based on views and then displays them in the theme or blog sidebar with custom styling. You can choose to display popular posts from last day, 7 days, 30 days or all time. It integrates seamlessly in to any theme. Having popular posts plugins is a good way to attract new readers and increase the fan base. We hope that this post help you in picking the right plugin for your popular posts section. If you liked the article, subscribe to our newsletter for similar updates right in your inbox. What are your favorite popular posts plugins for WordPress? Which one do you use for your blog or website? Share your opinions with us in the comment section below.